This fall I am just hinting about fall! I’m not bringing the whole hay wagon of decorations in and dumping it all over my home. For me, it’s not only easier, it suites my style more! Simple touches can often work better than holiday clutter too! Like adding a simple pillow. 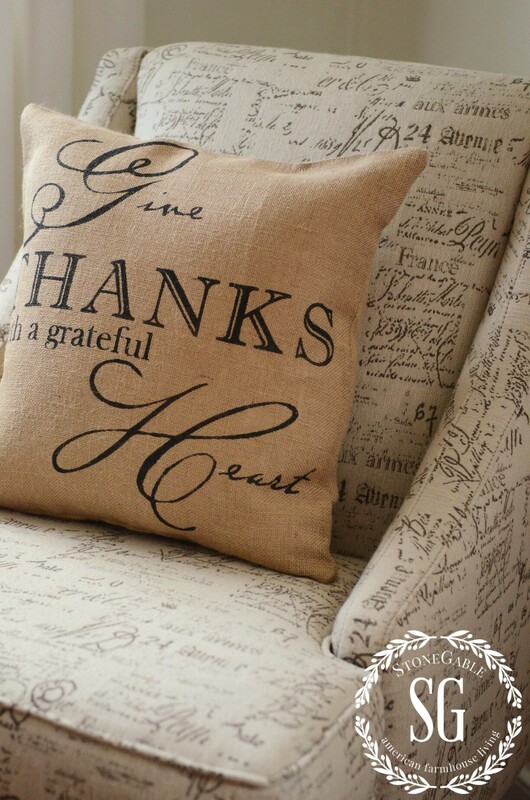 This pillow cover came from Hymns And Verses Etsy Shop. Beautifully made… I just love this verse! Perfect for the Harvest season! The bed is made with covering in rich fall colors. I have a confession… I leave this bedding on most of the year. It works with this room! During the fall season I think the bedding works particularly well, don’t you? I’m using a bed tray as a decoration in this room! When guests come the bed tray stays on the bed but it only holds magazines and books about our area. While the bedroom waits for family and guests the bed tray is called into duty as a fall vignette! I shopped StoneGable to find things to top off the bed tray. Look for a tutorial this week on how to cover books with burlap! There are so many wonderful burlap fabrics now… some plain and many with fabulous designs! Covering books with burlap gives them a uniform, updated look! And it’s very easy to do! The candle in the lantern is battery operated and gives off the nicest glow in the evening! The other side of the room is simple and uncluttered. I keep a big basket in all of my rooms for pillows. I don’t want my guest wading around a room with pillows all over the floor. When guest come the cart is filled with fluffy towels, water, essentials and goodies! 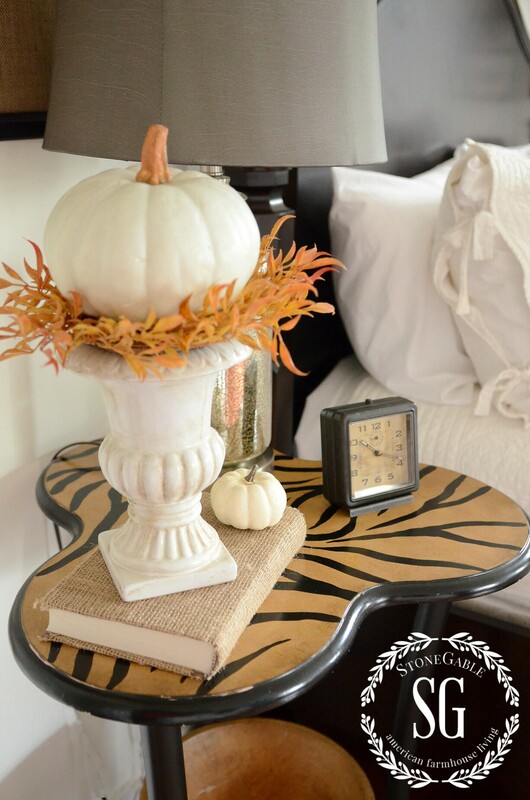 A white pumpkin in an urn decorates the painted nightstand! See, you don’t need to put a lot of effort in decorating! Take a lesson from me… do simple!!!! This room won’t stay empty for long! I’m happiest when my guest rooms are filled. I might add a pretty potted Mum next to the chair… what do you think? I’m making a few changes in this room this fall… and I’ll make sure to show you when I do! Hi! I tried to order some paint from the Maker’s Studio that your blog sent me too and I couldn’t order because I didn’t have a number for you (that have referred me). Well, I’m very confused. I also went to Amy Howard’s paint site. It is quite different from Maker’s. I know you have mentioned Bisquits and Gravy paint many times. I’d like to purchase that and a few other colors. Please direct me to an order site that will work. I’d also like to purchase some of the furniture cleaner and stain. Thank YOU!!! I love you and your blog. Lovely home! 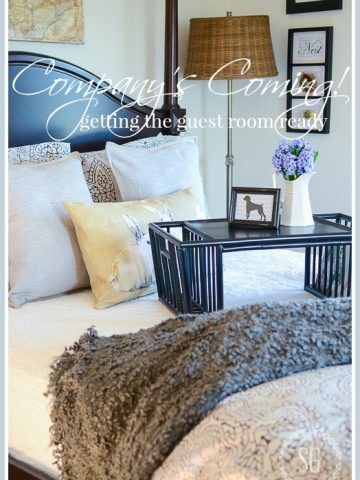 My I ask where you purchased the duvet cover in your guest room? Hi Becky, the duvet came from the Pottery Barn a few years ago. I see it once in awhile on their site. 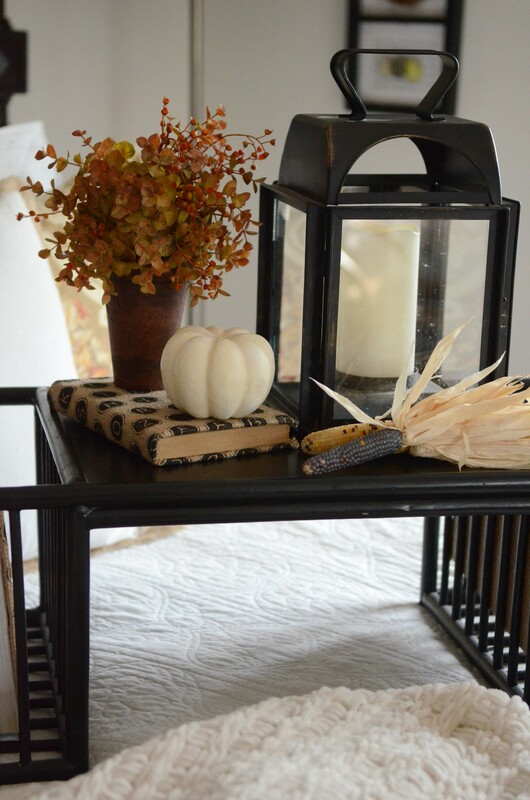 Ok I am getting excited about decorating for fall” thanks for the inspiration. When do you start putting out fall decorations? Is it a cooling down of temps, or a calendar date, or just when you want to? I know I am ready! Are you offering bed and breakfast offerings? I’ll be setting up a reservation! Love it! This is one of my favorite rooms in your home! Just enough fall touches to welcome the season without too much stuff!! Perfectly pretty! Love the subtle fall decor. Just right. 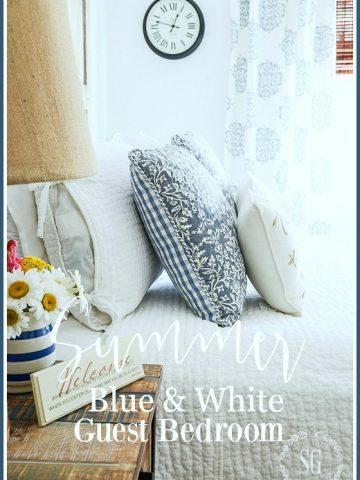 This is my inspiration for redoing my guest room! Can I ask where you got the chair with the writing on it from and also where you got the white curtains and the natural woven looking lampshade? Thanks so much! This is the most cozy room I have ever seen! Hi Susan, I found my white curtains here:http://rstyle.me/n/b2ni3sb6by7 (and they are on sale NOW!) The lampshade came from our local Pottery Barn Outlet and the chair with the writing on it came from here: http://rstyle.me/~8Z44g. Hope this helps. Thanks so much! Did you order the marshmallow or the white color? Yvonne…beautiful as always.. I love the chair you have the pillows on..where did you find it? Love this room! It looks so peaceful and a wonderful place to relax. My granddaughter would love the bed tray. She gets breakfast on a tray whenever she visits. Have been looking for one like this. Any suggestions? I am looking for a rug for my guest room and have considered the natural fiber rugs but I’ve worried they are not feet friendly. What’s your experience with the Ballard rug? Thanks so much! I don’t know about the natural fibers of Ballard. The ones I’ve used are from Amazon and Overstocks. It really depends on the nap and what fibers are used in the rug. We love natural fiber! Where do you order your natural jute rugs? And, are they jute or sisal? And, your roll up blinds? Redoing a house that was flooded and need sources. Love your home and just subscribed to your blog. The jute rug came from Ballard Designs and the blinds from Lowe’s. Bless your heart… I hope your home is back to normal in no time! Hello! I am new to your site and I am madly in love with you and your home and style! I have a question you may have answered at some point so forgive me if I’m repeating. I also use matelasse coverlets and I love how you have yours tucked in. What do you do about your box springs since you don’t use a dust ruffle? I am old school and just recently stopped using a dust ruffle but I know they’re not in fashion anymore. Do you use a fitted sheet over your box springs? Just white? Thanks so much! I only tuck in the Matelasse coverlets if there is a wood runner on the bed covering the box spring. If my box spring would show then I would not tuck in the coverlet. Hope this helps! would you mind sharing the paint color of that wonderful room? I’ve looked at a few other posts on your guest room, but haven’t seen it posted. I’ve been looking for such a perfect white…not too bright, not too dark…it’s perfect! Please come and visit us and stay at StoneGable!!!! Your room is waiting! Beautiful! I’d love to make a reservation please……. 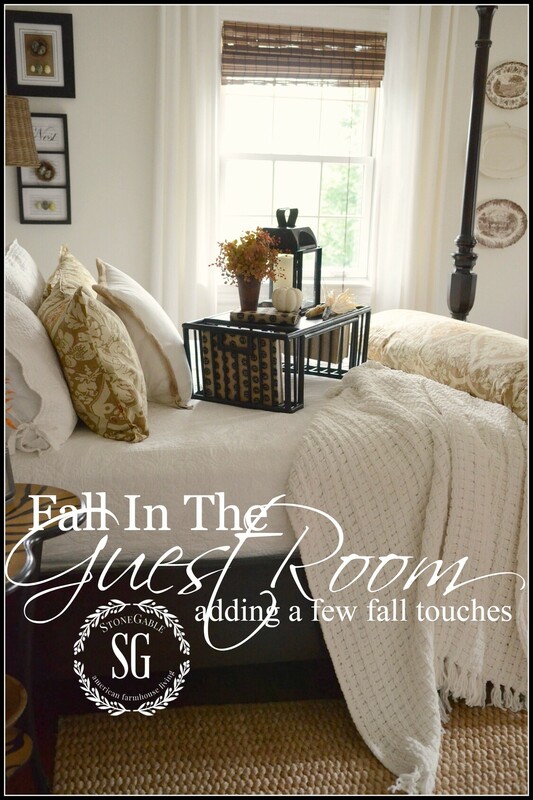 Your guest room is so gorgeous and looks cozy all ready for Fall Yvonne! Love it! 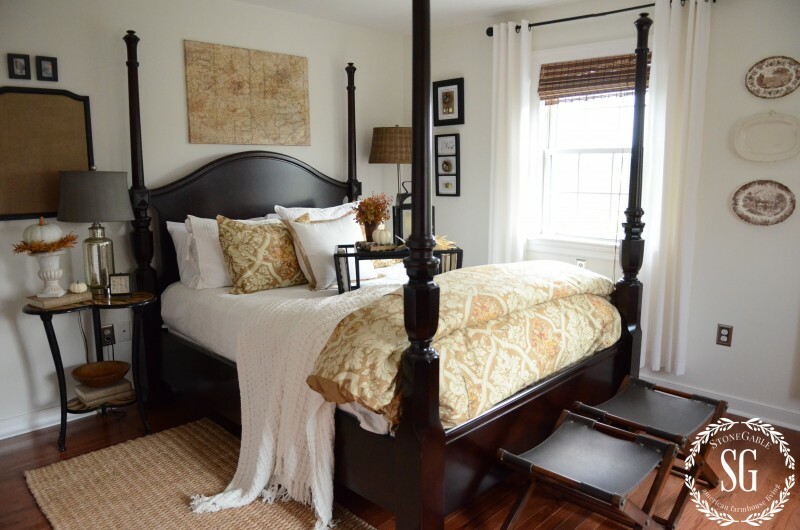 A room worthy of a B&B 5 star rating….I so love all that you have done in the room…so very cozy and welcoming…love the bed table…will need to be on the lookout for one myself….you have just the perfect touch of Fall in the room….perfection all around! Love the entire room; just perfect in every way. You even have one of my favorite fabrics on chair in the room. Thank you for shairing this beautiful room. 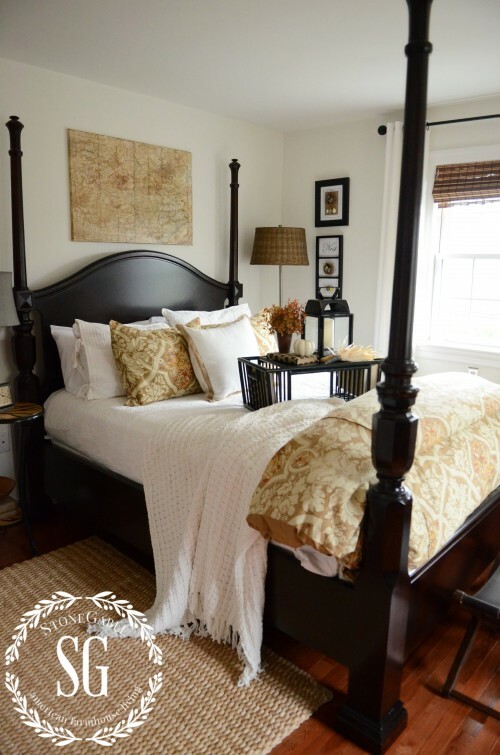 Your lovely room is an inspiration Yvonne! It is so inviting…clean, calm, sweet…a delight to study, can you tell me where you found your three piece frame with the nest & eggs tho? I would love to re-create this for my baby grandson’s nursery! Yvonne! Such talent you have! Thank you for sharing with us “mere mortals”. Your posts always spark my creativity! I love the simple fall decor, Yvonne. I have to admit…..Every time I see this room, I have an overwhelming urge to climb through my laptop screen, pull that duvet over me and get all snug as a bug in rug and sleep the day away! I honestly don’t know how your guest pull themselves away from that room and your lovely home! God gives each of us a gift and surely one of your’s is being a perfect hostest. What a lovely room, only a person with a sweet sweet spirit could create such beauty. Yvonne, this is a room that anyone would feel welcomed and comfortable to stay in. Lovely and well appointed. and thank you for mentioning more than once to simplify. I so agree!!! Big is better less is more is my mantra. Sometimes in homeowner’s exuberance to decorate they can get a bit heavy handed. I mentioned this in my latest post on how to do a budget friendly mantel. Happy Monday to YOU!! I don’t think I would ever leave, Yvonne. You have the greatest gift of not overlooking a single detail. 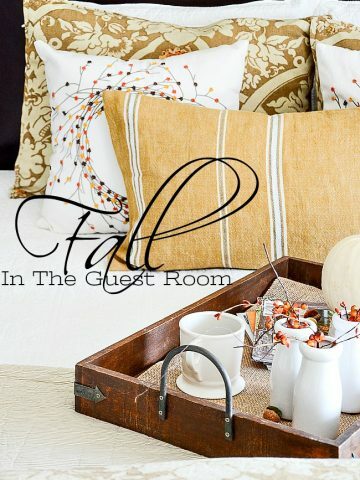 Just love the white pumpkin in the urn and the throw is perfectly imperfectly placed on the bed…love it all!! Can I learn to paint a table with tiger stripes like your table or did you buy it that way? It is a stunning piece in this gorgeous room! I bought mine, but I think it would be very easy to reproduce! I recall a post you did one year during the fall of the year, where you took a picture of the light coming through one of your windows and the gorgeous fall colors of one of the trees right outside that window. It was beautiful. I remember thinking, what a wonderful spot to curl up and read a book. To gaze out that window and daydream a little would be heavenly. Today’s post makes me feel the same way. The decor is perfect for fall..warm and inviting. With your special creative touch, what else would we expect to find? Now, just give me a comfy robe, a cup of coffee, and I will stand at that upstairs window gazing down at the farmland and anticipate the coming of the my favorite time of the year. 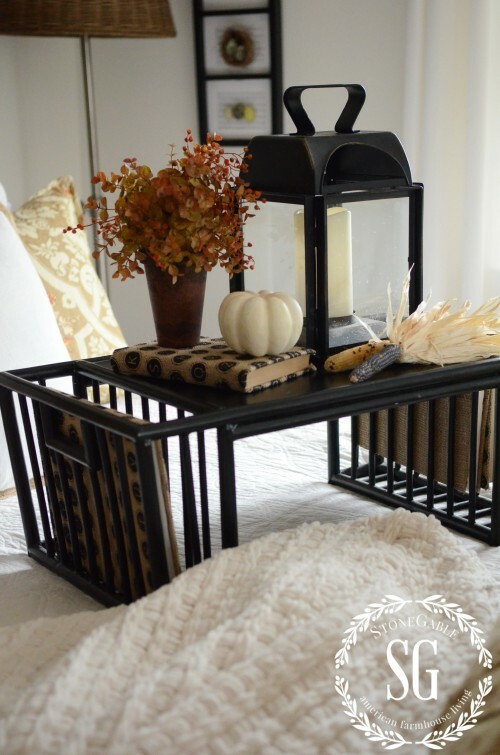 HUMMMMMMMMMMMMM……..
Looks so cozy and ready for fall! Really pretty! Tracy, I’m not sure what it is called. I got this duvet a couple of years ago. So sorry I can’t help you more. 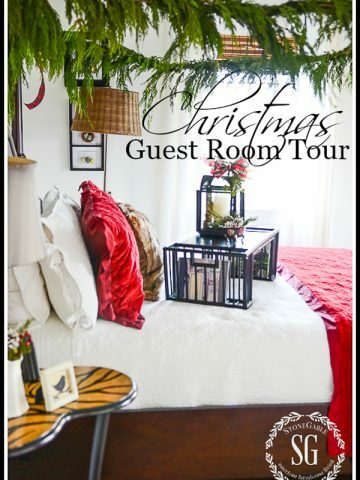 Such a lovely guest room, I like the neutrals and seasonal touches here and there, so warm and inviting! Just beautiful! This room is so beautiful and your pictures are amazing. Really lovely. So beautiful, classic style I love. I wouldn’t mess with a mum when guest arrive for that stand – mess being the key word, and you never know when someone’s allergies may kick into high gear. You strike me as the consummate hostess! Your guest room is absolute perfection Yvonne! I love all of the beautiful fall touches, but what I adore most about this room is the contrast of light and dark, mixed with soft and natural color, gorgeous furniture and so much wonderful texture throughout the room. What a warm, cozy, welcoming and relaxing space for your guests. Pinning!!!! Such a pretty guest room anyone would love to stay with you. Don’t make them too comfortable or they will never go home. Just a joke! I love the beautiful bed and the chest of drawers. Also, the light colors you used with a touch of gold. Elegant Fall. LOVE the whole room, so relaxing and cozy! Yes, a fall mum over by the chair or on the cart would be wonderful when guests come. OR more hydrangeas! Where did the duvet cover come from?? Thx! Hi Michelle, I got the duvet and shams at our local Potter Barn Outlet. I think I’ll change them up for the winter. Just the perfect touch of fall. Lovely! Gorgeous touches. Elegant & timeless….love it! Just gorgeous, Yvonne and I am curious as to what you will be changing. Lovely room! I hope fall comes here soon. It has still been humid and in the 90s. 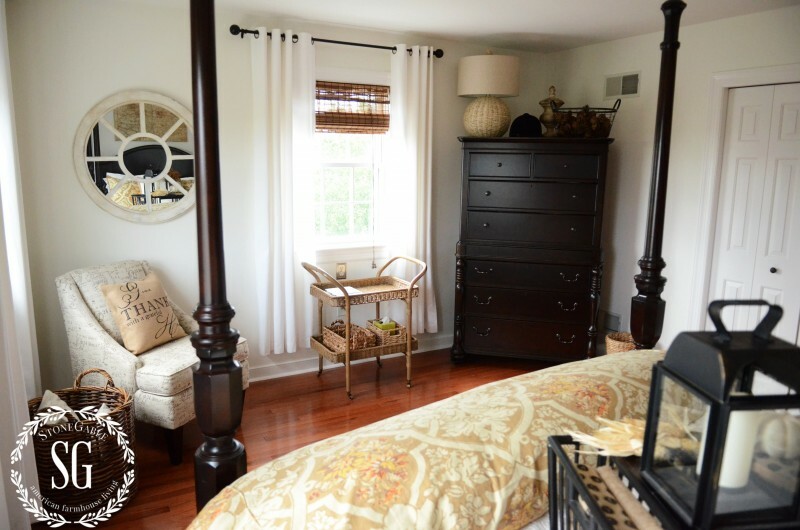 This is such a lovely guest room and it inspires me to spruce mine up a little. Love the elegance and simplicity. Okay! It’s settled! I’m packing right now. You won’t have to do anything because I’ll be cooking for myself in your marvelous kitchen and I’ll just go ahead and take care of my own linens and I’ll wash them in your great laundry room using your own detergent 🙂 I’ll be the perfect permanent guest. You won’t have to do a thing. And you won’t even have to buy me a Christmas present — just sitting at your table for Christmas brunch is enough. Thank you Yvonne. Oh! What’s your address???? You made me smile!!!! Come on over! It’s a beautiful room, Yvonne! I’m sure all of your guests love staying with you. It’s so warm and inviting. I think you’re right that simple touches of the season are often best! I love this room! If I came to visit I don’t think I would ever leave. I love the white quilt on the bed, your hardwood floors, well everything.. but my FAVORITE is that Paula Deen tall dresser!! It is sooo beautiful. Every time I see a picture of it my heart just swoons. I wrestled with the decision to get the Tobacco dresser. It was double my price point! I found it for a great price, but it was still expensive! I’m so so glad I decided it was worth getting! Sometimes we need to get the perfect piece… even if it’s more than you want to spend!